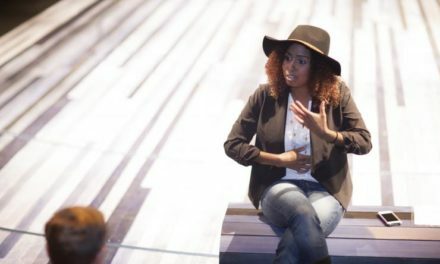 Tamara Tunie as Prospero. Photo by Michael Henninger, courtesy Pittsburgh Public Theater. A couple of decades ago my then-colleague Jan Hagens introduced me to a genre categorization that was new to me: the “drama of reconciliation.” His primary focus was German drama, but he also placed in this category a number of Shakespearean plays–including most of the so-called “problem plays”–that refused to sit neatly within the genres of tragedy, comedy, and tragicomedy. In particular he pointed out that the two oddest of Shakespeare’s plays–A Winter’s Tale and The Tempest–suddenly make new sense when you think of them as dramas of reconciliation; they each map the challenges (and to a certain extent the sheer impossibility) of moving beyond grievance and harm to atonement and forgiveness. 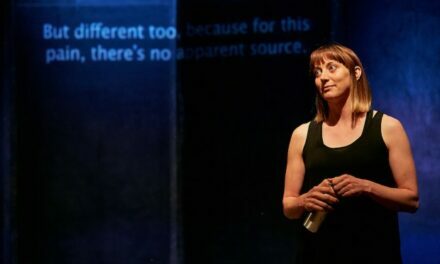 I don’t know whether Marya Sea Kaminski has ever heard of this genre category, but it’s clear from her adaptation of The Tempest that she understands that reconciliation is at the heart of the play’s dramatic journey. Kaminski–who also directs this engaging production–has framed Shakespeare’s plot as the chemotherapy-induced fever-dream of a dying Prospero, whose fantasy of revenge against estranged family and friends slowly transforms into something that approaches forgiveness. The production opens with an extended silent scene set in a cancer ward. 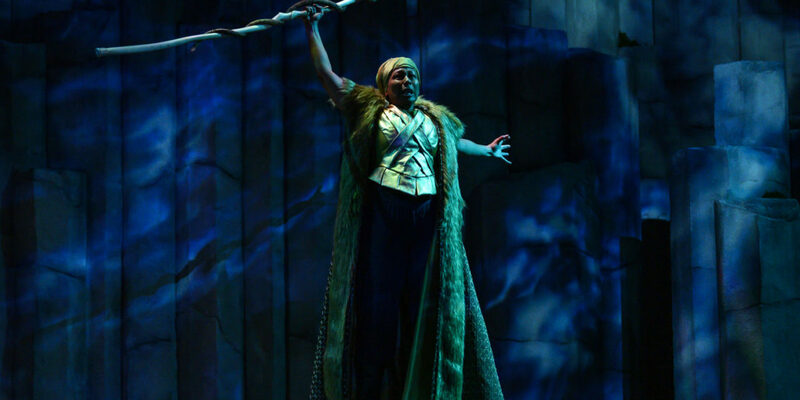 Prospero (a regal and commanding Tamara Tunie), lies weak and irritated in a hospital bed. People visit her–a nurse, an orderly, a doctor, bustling self-involved friends (and, we later learn, sibling) who bring flowers and hastily depart, a children’s choir, her daughter with her new love–and all the while, projected on a monumental cliff-like structure behind the hospital walls, a time-lapse video of the city outside pulses day into night into day into night. 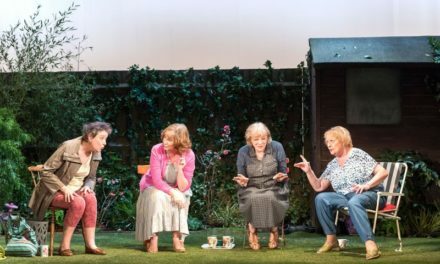 Although we don’t know who all these people are, the scene makes clear that for Prospero–as for any of us–illness and hospitalization bring both a bewildering sense of suspension of time and a galling loss of status and respect. Then it starts to snow, and in a moment of theatrical magic, Prospero steps through her hospital window and into the world of The Tempest, where she has mighty powers and full control over the fates of the people to whose ministrations and whims she had to submit as a hospital patient. The narcissistic frenemy visitors become the Queen and two courtiers who had banished Prospero and Miranda to the island, the supportive nurse becomes Ariel, the good doctor is Gonzalo, the cheeky orderly is Caliban, and other hospital staff and visitors fill out the roles of Stefano, Trinculo, and Ferdinand. And although we never learn the precise reasons why Prospero bears such ill will toward the three visitors who become her sibling Tonio and estranged friends Alonso and Sebastian, the betrayal story in Shakespeare’s play becomes a fitting proxy for the myriad physical and emotional betrayals that accompany a cancer diagnosis. L.B. Morse creates a mythical environment with the scenic and projection design, and there are a number of stunning visual moments, among them a scene towards the end of the play in which Prospero, shimmering gold against a backdrop of pale blues, purples, and glowing filaments of white, conjures her last bit of magic. Andre Pluess’s soundscape uses windchimes and xylophones to create an atmosphere of enchantment and mystery that is complemented by Nicole Pearce’s often otherworldly lighting palette. I should probably mention at this point that no roles in this production are played by actors who identify as male. 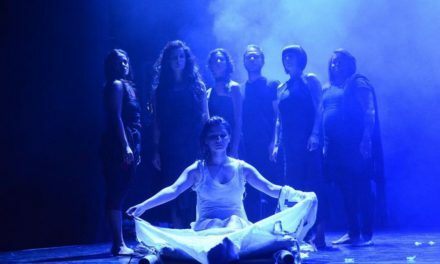 In addition to Tunie, who brings a magnetic physical presence to the stage, the thirteen-plus member cast includes particularly strong performances from Jamie Agnello and Bethany Caputo as the comic characters Trinculo and Stephano; Shammen McCune and Janelle Velasquez as the island “natives” Caliban and Ariel; and Deena Aziz (Queen Alonso), Laurie Klatscher (Gonzalo), Aryana Sedarati (Sebastian), and Rami Margron (Tonio) as the objects of Prospero’s revenge and eventual reconciliation. This article was originally published in The Pittsburgh Tatler on February 6, 2019, and is reposted with permission.